First of all great blog!! When I paste the url in Add Vector Layer | Protocol to load the dataset, I get an error like “invalid data source”. Strange the URL works for me in Add Vector Layer | Protocol. Did you make sure to copy the whole URL? The WFS does not work because QGIS does not support the WFS version used by the city server. Yes I copy the whole URL. I don’t know if have any interest to this, I use an http proxy to access the web and I have that in qgis settings (I always was able to add layers from wms and wfs so I think its not a problem). Maybe the proxy is causing the problem. You can try to download the geojson using a browser or wget first and then open from local disk. I’m just trying to recreate the routing you used in your example (I have just started to use pgRouting). The test-data from the URL works fine for me. 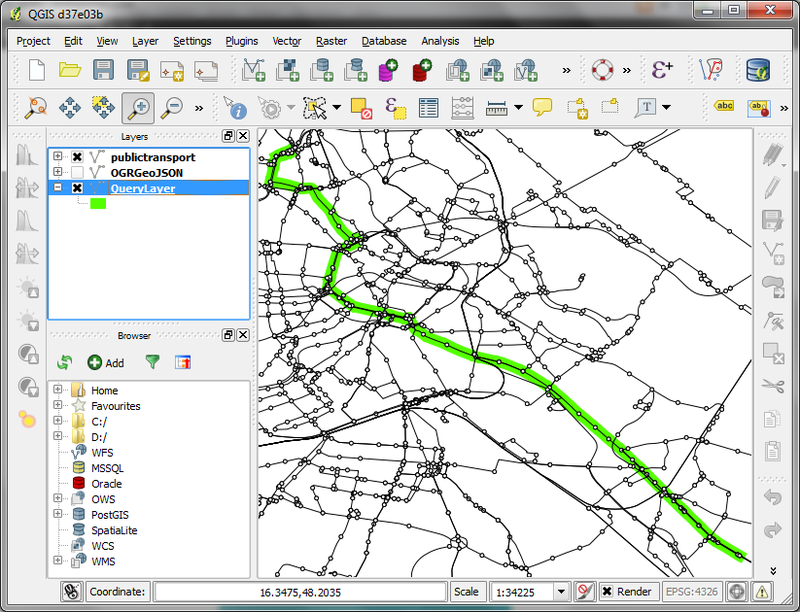 I can import it into QGIS without any problems (tried it with the current development version of QGIS from GIT). But there is a thing that does not work right out of the box for me. And that is the routing query itself (the one with the pgr_dijkstra call). I do not find a way from node 1 to node 3000! Is this just some test-query that should not work or should this work with the test data provided? I am not sure how to find the node ids to route from/to in general! Is there a way to map latitude/longitude to node_id? Or how do I handle routing like “get me from latitude x1/longitude y1 to latitude x2/longitude y2” (or before the geocoding adress1 to adress2)? after generating the source/target data a second time (using pgr_createTopology) the pgr_dijkstra query works now, but it shows a completely different route!? This brings me back to my question on how to find the id’s for specific points to route from/to. As far as I’ve seen, every time you execute pgr_createTopology, the node ids change randomly. You can check my follow-up post which covers how to extract nodes from the network Public transport isochrones with pgRouting. You’re correct! DB Manager has been improved a lot since 1.8. Actually, in 1.8 PostGIS Manager is more powerful than DB Manager but even that one can only import Shapefiles, so you first have to save the GeoJSON as Shapefile to then import it. 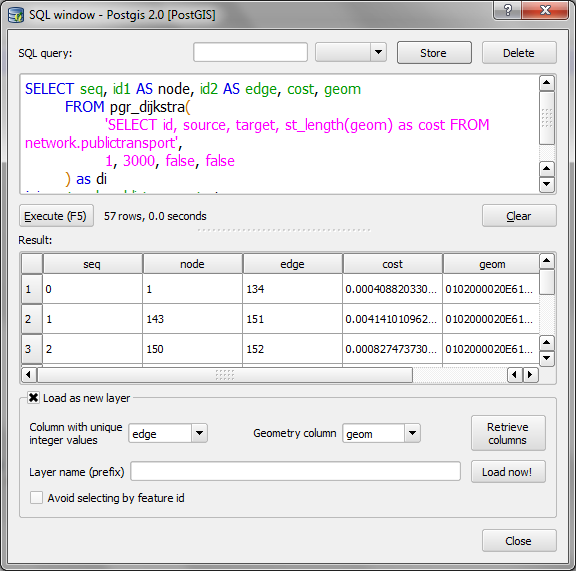 That’s QGIS – DB Manager – SQL window. Do you know what’s going wrong? As the error states, the query has to return a column called ‘id’. Currently, the query you are using resturns ‘gid’ but not ‘id’. That should be fixed by writing ‘gid’ AS id. When I tried to create the extention in Postgresql, I got the following error message: “ERREUR: n’a pas pu ouvrir le fichier de contrôle d’extension « C:/Program Files/PostgreSQL/9.2/share/extension/pgrouting.control » : No such file or directory”. I downloaded every version from Winnie and the file is nowhere to be found. Any clue? No worries! And yes, comments from new accounts have to be approved before they show up. From now on, your posts should appear immediately. what’s wrong why I got this error message? Did you import the ogrgeojson file into the network schema of your database? Yes. I have downloaded and unzipped in the way mentioned in this post. I will post it into the mailing list now. Thanks for your quick reply. I have posted it in the mail list, but no reply. I have removed everything (postgreSQL, postgis) and re-installed everything.I looked into every .ini file and config files but no luck so-far. I have couple of questions. 1. You said, it might be some right issues. What is that? 2. Is there any way other than pgrouting? or pgrouting with any other software to use queries? I am stuck with one of my project with this issue. Spent more than a day to figure this out. Please if you can shed some light. I really appreciate your works. I have one question. On the instructions i don’t see the steps to install the pg_routing functions. Im trying to do it by myself but …. first i got an error because the option LANGUAGE ‘c’ IMMUTABLE STRICT; have ‘C’ uppercase instead of lowercase i did fix that on the scripts. but looks like the function signature isnt on the librouting.dll file. I check all dll with a DLL viewer and coulldnt find in any of those. CREATE EXTENSION pgrouting; should take care of adding the functions to your database. I create the extension, and got several function with pgr_* prefix. I need shortest_path_shooting_star because my road have turn restrictions. Was that function replaced with a new one? Thanks, i will check with the new function. Hope isn’t much different. I have program installed in the correct directory but it did not work until I have added required information into the “PATH” section. Question on Part 3 of the process, is this SQL query actually modifying table network.publictransport, as when I run it I am not seeing any changes being applied to my table. Should this be run from pgAdmin screen or from QGIS? Also in the data loaded from the provided sample link (Vienna Public Transport) I can see a column called ‘qid’ but not one called ‘id’ is this an issue? They must have changed the dataset. I will have a look. Don't know if is my server fault the functions coalesce doesn't work properly to create the string with the edges values separated by ",". I’ve replaced the query of the doc by yours, and I get a syntax error. Strange thing is the query, separately, returns the value expected. Anyway, I’m not sure I’ve understood the logic of turn restrictions here. Basically, the restrictions table says: “the cost from this edge to this edge via this path will be X”, being X an arbitrary cost (for example, a really high value if you want to restrict that turn). Am I right? If that’s the situation, what’s the difference between doing that and just setting the cost of an edge to a really high value? gid [PK] serial; OBJECTID integer; LIBEZEICHNU char var; LTYP char var; LTYPTXT char var; SE_ANNO_CA char var; GEOM geometry(linestring); SOURCE integer, TARGET integer. Below Step 4 there is a comment “Note how the query joins the routing results and the network table together.” Please explain what is this meaning? I have tried also running the process after importing shape file using Database -> Split option as this method allows for ‘gid’ to be replaced by ‘id’ but this still makes no difference. If I import the GeoJSON layer into PostGIS using QGIS master’s DB manager, I get an “id” column. Note that I’m not using any Shapefile nor PostGIS Manager. At the end is a link to a simple data. I think I have it resolved now after running and testing multiple scenarios, I think the issue resolves around the fact that when creating topology occasional what happens is that the resulting topology creates a set of numbers where it seems the source and target are either too far out, too hard to connect or there is an error in the nodes. This prohibits the next query from finding ultimate route. I had to rerun create topology query (each time the results are different and after a couple of times the shortest route query started to work. However I found it to work more often when the using “id” an “the_geom” fields. Hi Anita. do you know how calculate the fraction for the starting / end node having the x,y to use the other function signature? I think st_line_locate_point should work well for this use case. Are you working on Windows? Did you notice the option for creation of the sample database during the installation procedure? Could you let me know how can I extract the geometry too. Apologies for posting a stupid question of getting the geometry of the shortest path. Hi, Anita, I follow your instruction and try to activate pgrouting in the very beginning procedure, but I can not find pgrouting.control file after I finished the installation of Postgre, I thought that’s why I can’t introduce pgrouting. How can I solve this problem? Did you copy the contents of the pgRouting ZIP file to the Postgres installation, e.g. C:\Program Files\PostgreSQL\9.2 as specified? You need to be specific about which steps you performed and what exactly is the error message and when does it appear. I am trying to replicate your example in the above quick guide but am having some difficulty getting the sample database (postgis_21_sample) created in step 6 of the very first procedure you describe to be visible in the database manager in Qgis 2.0. 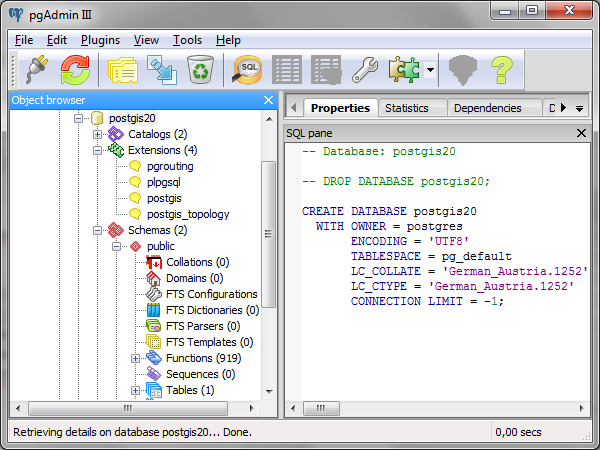 The database is visible in pgAdmin III but when I go to load the Wien public transport data layer from Qgis into “postgis_21_sample” in Qgis’s Database manager, I cannot seem to find it. 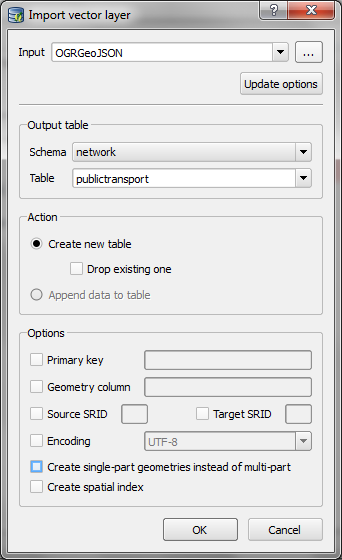 Should I first create a database layer in Qgis? If so, I also cannot seem to find where “postgis_21_sample” is located. Perhaps I have missed a very simple and basic step? In the “Add PostGIS Layer” dialog, you can set up a new database connection. If you installed PostGIS on your local computer, you can simply specify localhost as the database host. To your knowledge, is there a pgRouting for Mac? Hi Anita, thanks for your efforts.. Sorry I haven’t tested Win8 yet. I suggest to get in touch with the creators of the PgRouting Windows packages. how can I get contact with that person? From experience, do you expect that might be because of Windows version? Target vertex was not found. Did you make sure the target vertex id exists? How can I upgrade library version from 9.2 to 9.3. ? Did you make sure to get the correct pgRouting version from http://winnie.postgis.net/download/windows/pg93/buildbot/? Please correct me if I’m wrong, I downloaded this one “postgis-bundle-pg93x32-setup-2.1.3-1.exe”. I have win xp32. You need the pgrouting zip file not the postgis exe. and I have this version “pgr_version (2.0.0,pgrouting-2.0.0,0,d6ed2cb,master,1.46.1)”. It should be correct pgRouting version but still the same error. I think you will get more qualified answers to these questions if you ask the postgis developers.